Governor Mike Sonko making his acceptance speech. Nairobi — Nairobi Governor Mike Sonko has been appointed the Good Deeds Ambassador by an Israel-based organization for his generosity in helping the needy. Last December, an Israel delegation, led by Good Deeds Global Chief Executive officer Kaynan Rabino, said they will name Sonko their Good Deeds Ambassador for a three-year period. 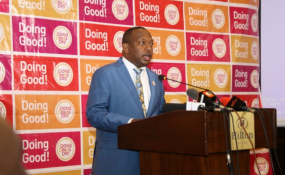 On Friday, Sonko was officially named the Good Deeds Ambassador at the ceremony attended by Israel Ambassador to Kenya Noah Gal Gendler and the Global CEO of Good Deeds and Vice President of Vision Ventures Kaynan Rabino at Hilton Hotel, Nairobi. Other guests who attended the ceremony include; Good Deeds Kenya Representative, Fredrick Sadia, and the Chairman of Safaricom Foundation, George Ogutu. In his acceptance speech, Sonko said he supports the mission of getting people to volunteer and choose to help others. "This is a noble cause that will make the world a better place and improve the lives of our fellow men and women," he stated. Sonko said he believes the main reason why he is the Governor of the Nairobi today is because of good deeds he has done to the majority of Nairobi residents and the Kenyans at large. A few years ago, Sonko set up an organization known as the Sonko Rescue team (SRT), to respond to the suffering and frustration. The organization has been instrumental in helping the people of Nairobi and Kenya as a whole, particularly those in low-income areas. "Our organization has provided clean drinking water to thousands of homes, paid hospital bills for the poor, cleaned our neighbourhoods, provided ambulance and hearse services and generally responded to basic needs and emergencies of our people, all free of charge," he said. He said this was one way of showing gratitude to the people who had shown confidence in him. Sonko told the delegates that SRT was designed as a rapid response service in cases of emergency and was financially sustained by the income from the public service vehicles that he owns. Above all, he added, SRT was aimed at inspiring the youth to community service, while at the same time providing them with employment and skills necessary for their future careers. In June 2017, the NGO Board, which regulates all non-governmental organizations in Kenya, named Sonko Rescue Team as the best performing charity organization in Kenya. "This was our crowning moment as our effort to alleviate poverty and suffering had been recognized. It also enabled us to re-dedicate ourselves to the service of humanity, a duty we carry out with passion to this day," said Sonko. Israeli Ambassador to Kenya Noah Gal Gendler said that Sonko has a good heart and has helped a lot of people and that is why he deserves such an honor.